High-pitched “see-see-see-whee-see-see,” falls and then rises. Description: Sexes similar. Mottled brown above; white below; whitish eyebrow; long, downcurved bill, and a stiff tail that serves as a prop. 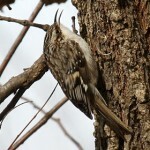 Behavior: While foraging for bark insects, the Brown Creeper always moves in an upward direction, circling tree trunks, then plunges to the base of the next tree. Habitat: During the breeding season these birds are found in fairly mature deciduous or coniferous forests. In the winter, the birds move to wooded streams, wooded parks, and suburbs. 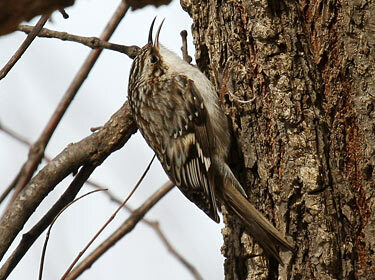 Where in Nebraska: Common winter visitor in eastern Nebraska and the Pine Ridge. Less common elsewhere in the state. Possible breeder in the Pine Ridge. Breeds in Fontenelle Forest (1-2 pairs). Fun Facts: Brown Creepers will often “freeze” when threatened and spread their wings out and remain motionless, effectively blending themselves into their surrounds.